Salt is a mineral composite of sodium and chloride. According to a report from the Massachusetts Department of Health and Human Services, the only difference in different types of salt is the size of the grain and how they are processed. Sea salt comes from the evaporation of seawater and contains trace minerals based on the original water source. Kosher salt is a product that has only sodium plus chloride. Kosher salt tends to have a larger crystal composition than sea salt. Nutritionally, both salts are the same. The larger size of kosher salts means you must convert the measurement to fit a recipe that calls for sea salt or the end product will taste wrong. Read the kosher salt package to determine a proper conversion for the product. 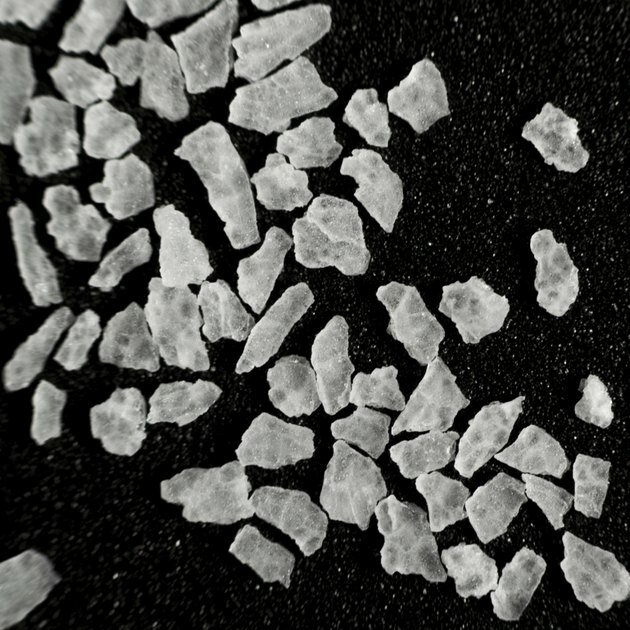 In many cases, the amount of kosher salt will exceed the necessary sea salt slightly. For example, the website for Morton Salt supplies a conversion table that suggests you use 1 1/4 teaspoon of kosher salt for every 1 teaspoon of sea salt. Pour out the required amount of salt based on the recipe. For instance, if the recipe asks for 1/2 cup course sea salt, pour 1/2 cup kosher salt instead. Add the additional salt needed to complete the conversion based on the table provided with the kosher salt. In the 1/2-cup example, you would add an additional 2 tablespoons of kosher salt, according to the Morton conversion formula. For 2 cups, you would include an additional 1/2 cup of kosher salt with the recipe. Follow the conversion formula for your product. The size of the crystals for kosher salt will vary based on manufacturer and processing. Pay attention to the size of sea salt crystal called for in the recipe. Sea salt comes as fine or coarse. The conversion will be different for fine sea salt. For standard table salt, 1 teaspoon of kosher salt would equal 1 teaspoon of regular salt. Morton does not recommend using their kosher salt for baking except as a topping. The National Heart, Lung and Blood Institute reports that you should not consume more than 1,500 to 2,300 milligrams of sodium a day, regardless of the variety of salt you prefer. If you suffer from high blood pressure or fall into a high-risk group, such as African-American, discuss your sodium intake with your doctor. Medically, there is no difference between kosher and sea salt.